16/04/2019: Congratulations to our friend and QT Lab alum Michael Vanner who today, at a national event hosted at the University of Queensland, was awarded of one of the two NMI Prizes for 2019! Dr Bruce Warrington, Australia's Chief Metrologist and head of the National Measurement Institute, gave a fantastic overview of the significant revision to the SI, the International System of Units, which will occur 20th May this year —from then the SI will be based on a set of definitions each linked to the laws of physics—followed by a brilliant talk by Michael on his research in Australia that formed the basis of the prize. Utterly fascinating! 25/03/2019: Congratulations to Jacqui Romero for being awarded of one of the two Westpac Research Fellowships for 2019! What a simply wonderful way to start the week! 22/03/2019: Come join Aidan Byrne, Lee Constable, Leila Cuttle, Tamara Davis, Andrew Stephenson, and Andrew at the World Science Festival at an adults-only night of comedy and science, Science Says!, hosted by the ever-inestimable Joel Gilmore. 22/02/2019: Our paper on Charting the Australian quantum landscape appeared today in Quantum Science and Technology. Many congratulations to Tara on your second physics paper! 11/02/2019: Many congratulations to Jacqui Romero who today was announced as one of the 15 International Rising Talents of 2019 in the L’Oréal-UNESCO International Awards for Women in Science! Jacqui will join the other 14 honorees at a ceremony in Paris on 14 March. What a way to start the year! 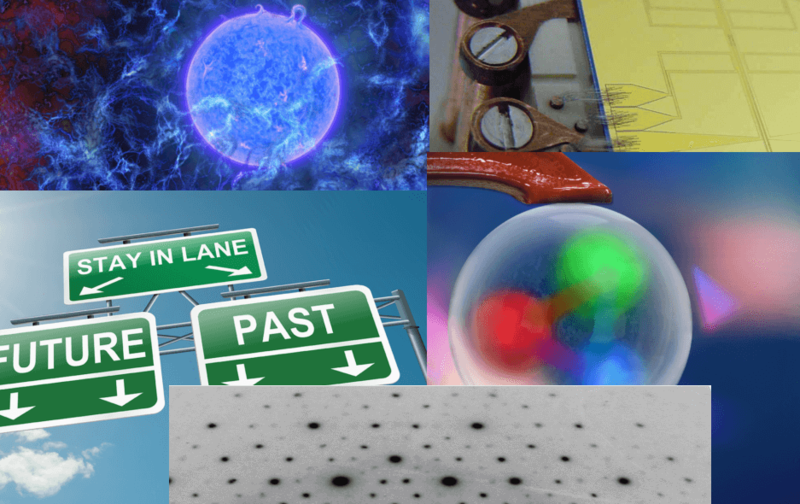 13/12/2018: And in a great finish to the year our paper on events happening in indefinite order has been picked by Physics World as one of the Top 10 Breakthroughs of 2018! It is a great honour indeed to be listed with— to name but a few— magic-angle graphene, propellor & combustion-free flight, and quasicrystal superconductivity. Go check out the list and see what your favourite is! 11/12/2018: Many congratulations to Jacqui Romero for winning the 2018 Ruby Payne-Scott Award for excellence in early-career research! The medal was presented during a rather nice dinner at the 23rd Australian Institute of Physics Congress. 06/12/2018: Well this is delightfully unexpected: our paper on events happening in indefinite order has been shortlisted as a 2018 Breakthrough of the Year by Hamish Johnston, the editor of Physics World. Many congratulations Kaumudi, Christina, Michael, Fabio, Cyril and Jacqui! 28/11/2018: That was fun! This morning a score or so of EQUS folk attended a Parliamentary Friends of Science breakfast on quantum technology. There were speeches by Andrew and Australian of the Year Michelle Simmons, with great questions and comments following, and before and after the room was full of parliamentarians and their staff, policymakers, scientists, and engineers all happily chatting away. A great way to communicate the importance of quantum technology for our society! 10/10/2018: Our paper on Certification and Quantification of Multilevel Quantum Coherence appeared today in Physical Review X. Many congratulations to Martin, Thomas, Marco, Ludovico, Sarah, Gerardo, Alessandro and Marco: it was a mighty effort and a long time coming! 30/08/2018: Our paper on Hectometer Revivals of Quantum Interference appeared today in Physical Review Letters. Many congratulations to Markus, Sarah, and Till, and to the European team of Simon and Vincenzo, for the great collaboration and results. And as a nice bonus, it's awesome to get a SI unit into the title of a quantum paper! 23/08/2018: In today's ScienceNews Emily Conover has written a nice article on our quantum switch paper, A new quantum device defies the concepts of ‘before’ and ‘after’. Please check it out! 17/08/2018: There's a very nice write-up by Adrian Cho today in Science on our quantum switch work, Quantum chicken-or-egg experiment blurs the distinction between before and after. Go have a read! 02/08/2018: Our paper on Multi-time quantum correlations with no spatial analog appeared today in npj Quantum Information. Many congratulations to Martin, Fabio, Michael, and Alessandro. We're now on three continents but it'll be great to work together again soon! 26/07/2018: And in a nice mid-winter treat, Our paper on an Unifying framework for spatial and temporal quantum correlations appeared today in Physical Review A. Many congratulations to Fabio, Martin, Michael, and Alessandro! 19/07/2018: Congratulations to Dr Geoffrey Gillett who leaves us today to join Quantum Valley Ideas Laboratories. It doesn't seem that long since you joined us as an undergraduate Geoff, and it has been an absolute privilege to work with you during your PhD and postdoc. Enjoy Waterloo and we look forward to hearing all about it soon! 01/06/2018: Andrew is in today's podcast from The Conversation, Trust Me, I'm an Expert. If you only want to hear about things quantum, it starts at 18:15, otherwise the first two stories are on terrorism and popping pimples. Either way, enjoy! 18/05/2018: ...and that was really quick. There is a very nice write-up of our paper in phys.org, Can a quantum drum vibrate and stand still at the same time?. Recommended! 18/05/2018: Our paper on Generation of Mechanical Interference Fringes by Multi-Photon Counting appeared today in New Journal of Physics. Many congratulations to Martin, Till, Michael, and particularly to Lewis for his first—but definitely not last!—scientific paper! 10/05/2018: ...aaand that was quick. There are very nice write-ups of our paper in Newsweek and msn, plus coverage in all the science channels like ScienceAlert and phys.org. If you have a moment check them out! 09/05/2018: Our paper on Challenging local realism with human choices appeared today in Nature. This was a lot of fun, more than 100,000 people participated, and it's our first time doing science as part of a large collaboration: 108 authors! (And in a nice bit of numerology, it is Andrew's 100th paper and he is 100th author). Many congratulations to Martin, and to Tara for her first scientific paper! 22/01/2018: Ming Su starts his PhD in the QT Lab today, joining us from the University of Illinois at Urbana-Champaign. Welcome to the lab Ming, it's great to have you join us! Older news can be found here. Please feel free to or ring me on +61 7 3365 3418. The qt lab is a proud founding member of: the Australian Research Council Centre of Excellence for Engineered Quantum Systems, 2011–2024; the Centre for Quantum Computing and Communication Technology, 2011–2017; and the Centre for Quantum Computer Technology, 2000–2010.